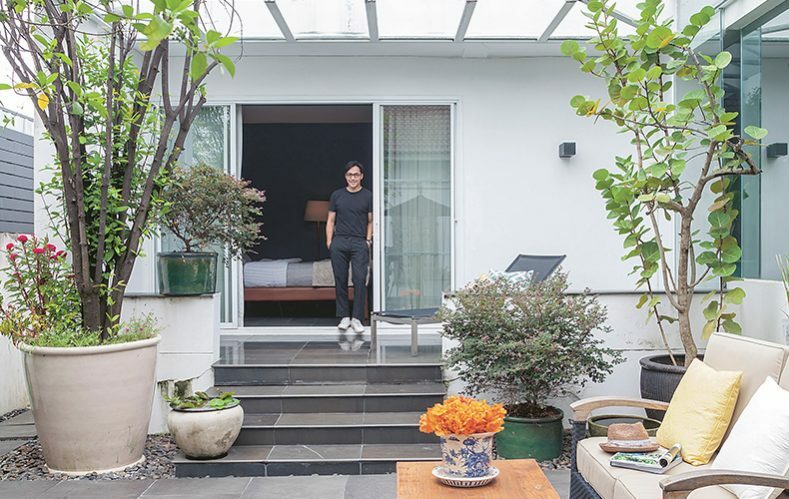 This beautiful house belongs to Bhalangtham Klomthongsuk, a well-known drama series organizer and television personality. The single-level home plan takes up most of the 200-square-wah land space with modern living amenities and a private retreat amidst nature. The peaceful setting fits the lifestyle needs of the homeowner whose name translates as the power of dharma. 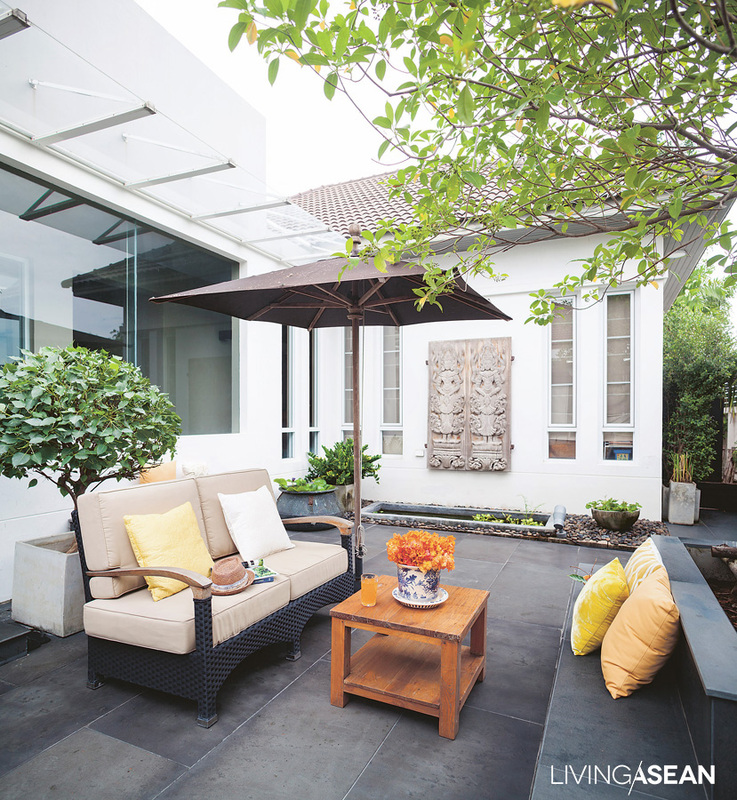 A couch makes for a cozy outdoor room between Bhalangtham’s bedroom and the nearby compact garden. 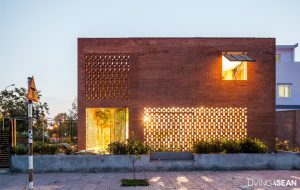 The courtyard that connects the bedroom wing to the function wings is bright, airy, and suitable for multiple purposes. 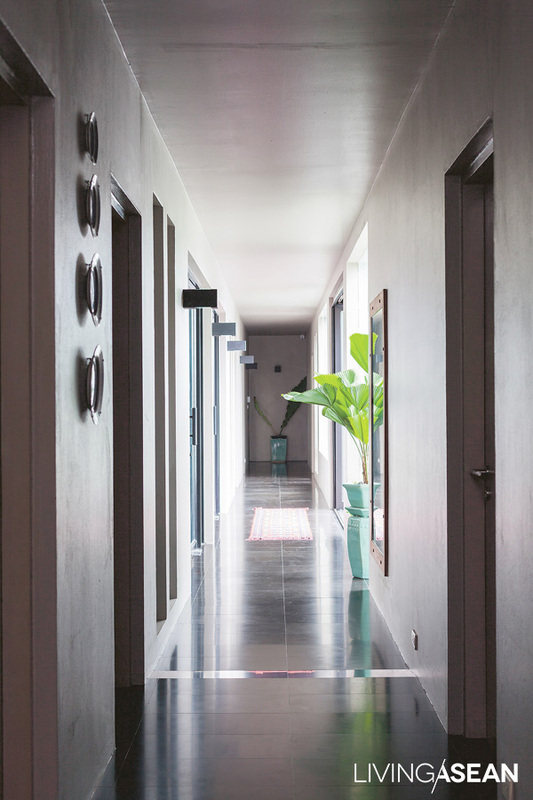 From the main entrance, a hallway leads to a corridor that connects to the left and right wings of the house. The right wing contains a kitchen and dining room, while the left wing has a bedroom with private bath that has since been transformed into a multi-use space. 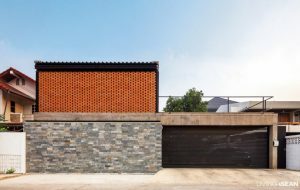 The most outstanding part of the house is a small courtyard garden at the center of the home plan where Bhalangtham’s bedroom is located. The open space offers refreshing environment in the middle of lush foliage. There’s an outside sitting area with a private garden view. 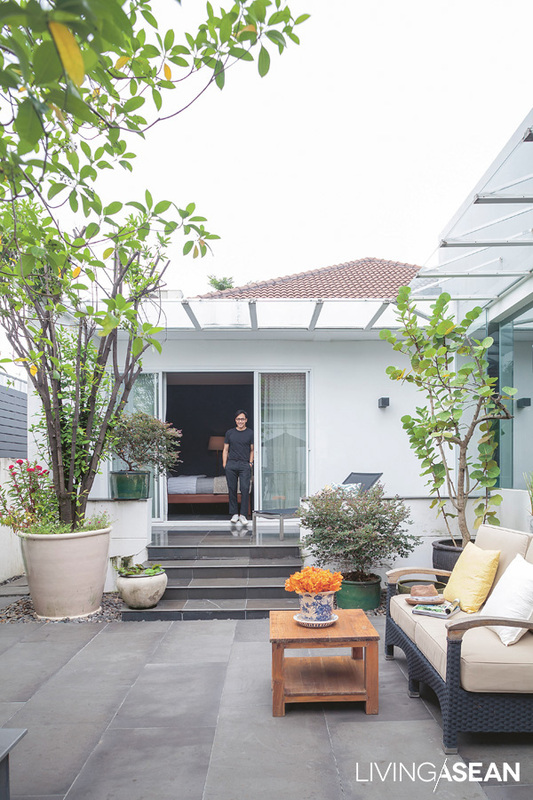 Lined with greenery, the house’s main entrance feels warm and inviting. Creative vertical garden ideas paired with floor-standing houseplants add a relaxing tropical feel to the entryway. The hallway leads to a living room lit by natural daylight that streams into it from one side of the building. Indoor plants re-humidifies the room preventing it from feeling too dry. The duck-head green of the wall and the cream and beige of living room furniture provide an agreeable contrast. Green leaves freshen the atmosphere and make the room feel warmer and more inviting. The living room is part of the function wing that’s designed to serve multiple purposes. An ethnic design carpet adds curious excitement to the room. 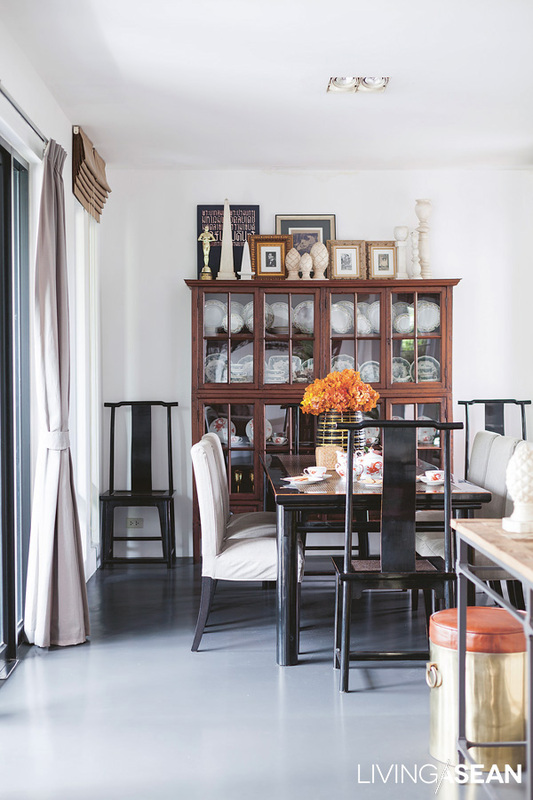 A small dining area adjoining the living room is flexible and party ready, thanks to a chinorserie table that was a gift from the previous homeowner. 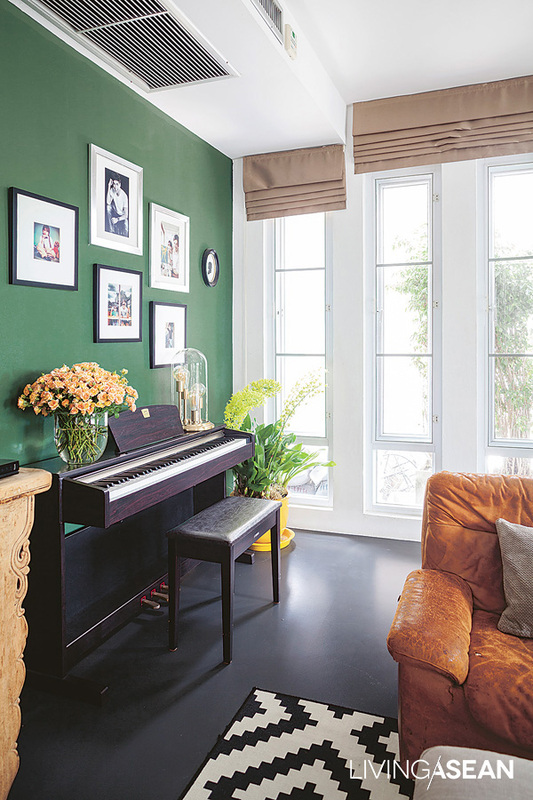 The metallic duck-head green dominates a corner where young Arty practices music. 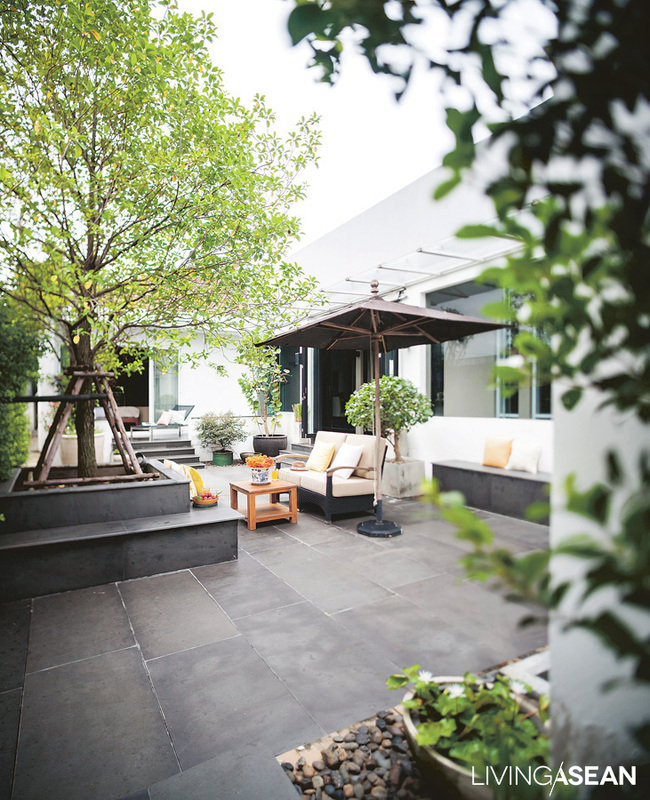 Like the homeowner intended, the green room serves to connect indoor spaces with the lush courtyard outside while the sound of music rejuvenates the atmosphere. 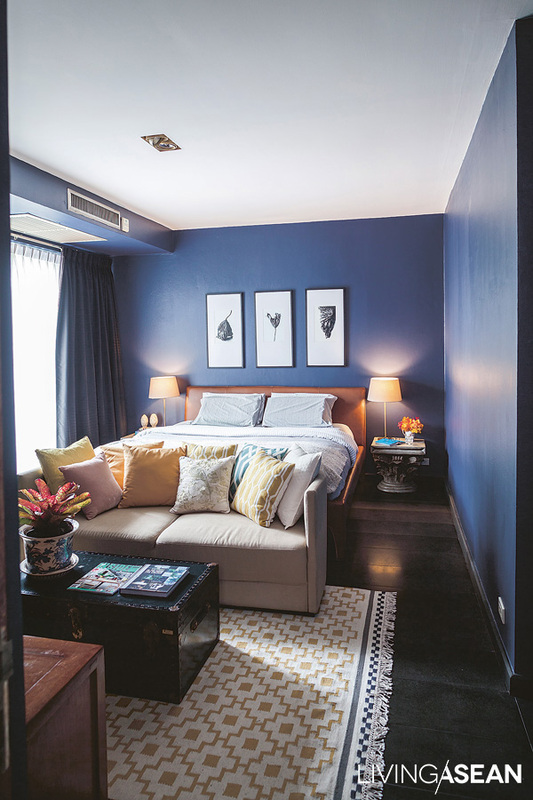 The dark shade of blue in Bhalangtham’s bedroom contrasts with the beige of leather upholstery on the furniture and the floor in natural wood stain. An area carpet in lighter shades brightens the room. 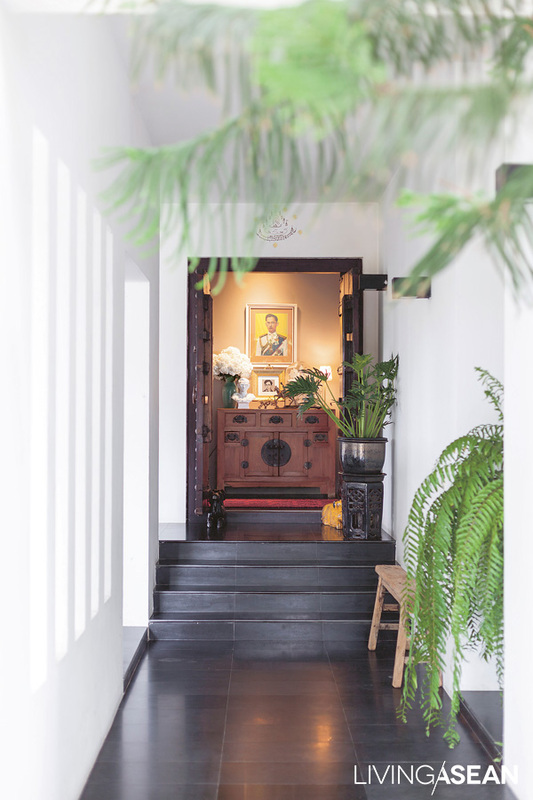 A perfect amalgam of chinoiserie, vintage, modern, and classic styles is a distinctive feature that gives the house meaning and character. Combine that with a courtyard filled with lush foliage of the container garden, and the benefits are amazing. Despite its small size, the patch of greenery serves as the lungs of the house, a condition that ensures everyone wakes up fresh and happy every day. For the homeowner, nothing compares to his favorite hangout with a private garden view. Besides the lone tree that’s the focal point of the yard, the outdoor room is adorned with potted houseplants, mostly tropical species. Plant containers in various shapes and sizes offer plenty of seats that make the area party ready.